I've had extra bits of pine sitting on my desk from a card I made a few weeks ago and decided it was time to stop moving them out of the way and use them up! I kept it quite simple and just created some layers of Smoky Slate and Warmth & Cheer Designer Series Paper on my Basic Gray card. In one corner I added the pine branches (Garden Green and Pear Pizzazz) and cone (Copper Foil) that had been knocking around for some time. I only glued a little bit of the boughs, so that they remain loose. 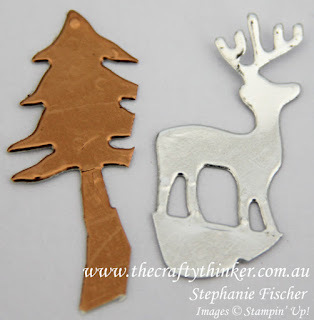 I cut one of the Merry Tags once in Silver Foil and once in Copper Foil. I then cut the reindeer and treese from the copper version, leaving enough of a "tail" so that I could attach them to the back of the silver one. I cut the reindeer off the silver bauble, following the "snow line". I kept him for use on a later card - thus continuing my ever-present pile of elements awaiting use! I carefully removed the smaller tree from the silver bauble then with Multi-Purpose Glue on the "tails", I adhered the copper reindeer and tree into position. I cut some Basic Gray cardstock with one of the Layering Circle dies and adhered it to the back of the bauble. I made a loop with some of the gold bakers twine from the Trio Pack, looped it over a pine bough and used a glue dot to keep it in position. I positioned the bauble with a dimensional. The final touch was the bow of silver Glitter Ribbon in the top corner. 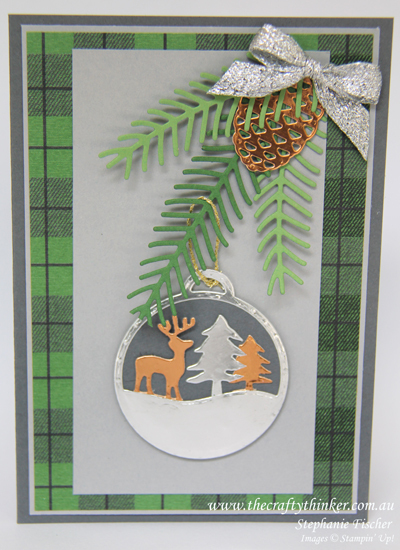 This card could easily be stepped up by using an embossing folder or ink on the top layer or perhaps shaping the edges with some die-cutting.